Loitering munitions fit in the niche between cruise missiles and unmanned combat aerial vehicles (UCAVs) sharing characteristics with both. They differ from cruise missiles in that they are designed to loiter for a relatively long time around the target area, and from UCAVs in that a loitering munition is intended to be expended in an attack and has a built-in warhead. Loitering weapons first emerged in the 1980s for use in the Suppression of Enemy Air Defenses (SEAD) role against surface-to-air missiles (SAMs), and were deployed for the SEAD role in a number of military forces in the 1990s. Starting in the 2000s, loitering weapons have been developed for additional roles ranging from relatively long-range strikes and fire support down to tactical, very short range battlefield systems that fit in a backpack. Loitering munitions have proliferated into use by at least 14 countries, with several different types in use as of 2017. The rising proliferation and the ability to use some systems as lethal autonomous weapons coupled with ethical concerns over such use have led to research and discussion by International humanitarian law scholars and activists. Northrop AGM-136 Tacit Rainbow on display at the National Museum of the U.S. Air Force in Dayton, Ohio. Initially, loitering munitions were not referred to as such but rather as suicide UAVs or loitering missiles. Different sources point at different projects as originating the weapon category. The early 1980s initial Israeli Delilah variants or the failed US AGM-136 Tacit Rainbow program are mentioned by some sources. Alternatively, the late 1980s IAI Harpy which was widely exported is considered by some as the first loitering munition system. the Tacit Rainbow unmanned jet aircraft being developed by Northrop to loiter on high and then swoop down on enemy radars could be called a UAV, a cruise missile, or even a standoff weapon. But it is most definitely not an RPV. The response to the first generation of fixed installation surface-to-air missiles (SAMs) such as SA-2 and SA-3 was the development of the anti-radiation missile such as AGM-45 Shrike and other means to attack fixed SAM installations, as well as developing SEAD doctrines. The Soviet counter-response was the use of mobile SAMs such as SA-6 with intermittent use of radar. Thus, the SAM battery was only visible for a small period of time, during which it was also a significant threat to high-value Wild Weasel fighters. In 1982 Operation Mole Cricket 19 various means including UAVs and air-launched Samson decoys were used over suspected SAM areas to saturate enemy SAMs and to bait them to activate their radar systems, which were then attacked by anti-radiation missiles. In the 1980s, a number of programs, such as the IAI Harpy or the AGM-136 Tacit Rainbow, integrated anti-radiation sensors into a drone or missile air frames coupled with command and control and loitering capabilities. This allowed the attacking force to place relatively cheap munitions in place over suspected SAM sites, and to attack promptly the moment the SAM battery is visible. This integrated the use of a drone as a baiting decoy with the attack role into one small and relatively cheap platform in comparison to the alternative wild weasel jet fighter. Starting in the 2000s, loitering weapons have been developed for additional roles beyond the initial SEAD role ranging from relatively long-range strikes and fire support down to tactical, very short-range battlefield use such as the AeroVironment Switchblade which is deployed at the platoon level and fits in a backpack. A documented use of loitering munitions was in 2016 Nagorno-Karabakh clashes in which an IAI Harop was used against a bus functioning as a troop transport. Loitering munitions may be as simple as an unmanned aerial vehicle (UAV) with attached explosives that is sent on a potential kamikaze mission, and may even be constructed with off the shelf commercial quadcopters with strapped on explosives. Purpose built munitions are more elaborate in flight and control capabilities, warhead size and design, and on-board sensors for locating targets. Some loitering munitions use a human operator to locate targets whereas others, such as IAI Harop, can function autonomously searching and launching attacks without human intervention. Some loitering munitions may return and be recovered by the operator if they are unused in an attack and have enough fuel; in particular this is characteristic of UAVs with a secondary explosive capability. Other systems, such as Delilah or IAI Harop, don't have a recovery option and are self-destructed in mission aborts. Loitering munitions fit in the niche between cruise missiles and unmanned combat aerial vehicles (UCAVs). Block IV Tomahawk cruise missile. Small wing area is optimized for high-speed cruise. 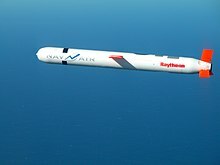 Whereas some cruise missiles, such as the block IV Tomahawk, have the ability to loiter and have some sensory and remote control features, their primary mission is typically strike and not target acquisition. Cruise missiles, as their name implies, are optimized for long-range flight at constant speed both in terms of propulsion systems and wings or lifting body design. They are often unable to loiter at slow fuel-efficient speeds which significantly reduces potential loiter time even when the missile has some loiter capabilities. Conversely almost any UAV could be piloted to crash onto a target and most could be fitted with an improvised explosive warhead. However the primary use of a UAV or UCAV would be for recoverable flight operations carrying reconnaissance equipment and/or munitions. While many UAV designs are explicitly designed with loitering in mind, they are not optimized for a diving attack often lacking forward facing cameras, lacking in control response-speed which is unneeded in regular UAV flight, and are noisy when diving at the target potentially providing warning to the target. UAV's, being designed as multi-use platforms, often have a unit cost that is not appropriate for regular one-time expendable mission use. The primary mission of a loitering munition is reaching the suspected target area, target acquisition during a loitering phase, followed by a self-destructive strike, and the munition is optimized in this regard in terms of characteristics (e.g. very short engine life time, silence in strike phase, speed of strike dive, optimization toward loitering time instead of range/speed) and unit cost (appropriate for a one-off strike mission). Loitering munitions that are capable of making autonomous attack decisions (man out of the loop) raise moral, ethical, and international humanitarian law concerns because a human being is not involved in making the actual decision to attack and potentially kill humans, as is the case with fire-and-forget missiles in common use since the 1960s. Whereas some guided munitions may lock-on after launch or may be sensor fuzed, their flight time is typically limited and a human launches them at an area where enemy activity is strongly suspected, as is the case with modern fire-and-forget missiles and airstrike planning. An autonomous loitering munition, on the other hand, may be launched at an area where enemy activity is only probable, and loiter searching autonomously for targets for potentially hours following the initial launch decision, though it may be able to request final authorization for an attack from a human. The IAI Harpy and IAI Harop are frequently cited in the relevant literature as they set a precedent for an aerial system (though not necessarily a precedent when comparing to a modern naval mine) in terms of length and quality of autonomous function, in relation to a cruise missile for example. ^ Reedy, Edward K. (1 January 1987). "Radar ECCM Considerations and Techniques". In Eaves, Jerry L.; Reedy, Edward K. (eds.). Principles of Modern Radar. Springer US. pp. 681–699. doi:10.1007/978-1-4613-1971-9_22. ISBN 978-1-4612-9170-1. ^ "Suminsby, Robert E. Fear no Evil: Unmanned combat air vehicles for suppression of enemy air defenses. AIR UNIV MAXWELL AFB AL AEROSPACE STUDIES INST, 2002". ^ Takahashi, Timothy, et al. "A multi-disciplinary survey of advanced subsonic tactical cruise missile configurations." 43rd AIAA Aerospace Sciences Meeting and Exhibit. 2005. ^ "Franklin, Michael. "Unmanned combat air vehicles: opportunities for the guided weapons industry?." RUSI Occasional Paper, www. rusi. org/downloads/assets/Unmanned_Combat_Air_Vehicles. pdf (29.3. 2011) (2008)" (PDF). RUSI.org. Retrieved 15 June 2017. ^ "Liu, Xuancen, et al. "Optimal Design of Loitering Munition Trajectory in Complex Battlefield Environment." (2016)". Atlantis Press. ^ Snyder, Derek J. (25 April 2017). "Design Requirements for Weaponizing Man-Portable UAS in Support of Counter-Sniper Operations" – via Defense Technical Information Center. ^ Garcia, Denise. "Killer robots: Why the US should lead the ban." Global Policy 6.1 (2015): 57–63. ^ Sharkey, Noel. "Saying 'no!' to lethal autonomous targeting." Journal of Military Ethics 9.4 (2010): 369–383. ^ "Mortensen, Erika Steinholt. Autonomous weapon systems that decide whom to kill. How international humanitarian law and international human rights law regulate the development and use of offensive autonomous weapon systems during international armed conflicts. MS thesis. UiT Norges arktiske universitet, 2016" (PDF). ^ Alston, Philip. "Lethal robotic technologies: the implications for human rights and international humanitarian law." JL Inf. & Sci. 21 (2011): 35. ^ "Crootof, Rebecca. "The Varied Law of Autonomous Weapon Systems." (2015)" (PDF). ^ Evan Wallach and Erik Thomas (2016). "The Economic Calculus of Fielding Autonomous Fighting Vehicles Compliant with the Laws of Armed Conflict" (PDF). Yale Journal of Law & Technology. 18: 1–25.